In 1913 I had the happy idea to fasten a bicycle wheel to a kitchen stool and watch it turn. A few months later I bought a cheap reproduction of a winter evening landscape, which I called "Pharmacy" after adding two small dots, one red and one yellow, in the horizon. It was around that time that the word "Readymade" came to my mind to designate this form of manifestation. A point that I want very much to establish is that the choice of these "Readymades" was never dictated by aesthetic delectation. The choice was based on a reaction of visual indifference with at the same time a total absence of good or bad taste ... in fact a complete anaesthesia. Sometimes I would add a graphic detail of presentation which, in order to satisfy my craving for alliterations, would be called "Readymade aided." At another time, wanting to expose the basic antinomy between art and "Readymades," I imagined a "Reciprocal Readymade": use a Rembrandt as an ironing board! I realized very soon the danger of repeating indiscriminately this form of expression and decided to limit the production of "Readymades" to a small number yearly. I was aware at that time, that for the spectator even more for the artist, art is a habit forming drug and I wanted to protect my "Readymades" against such a contamination. 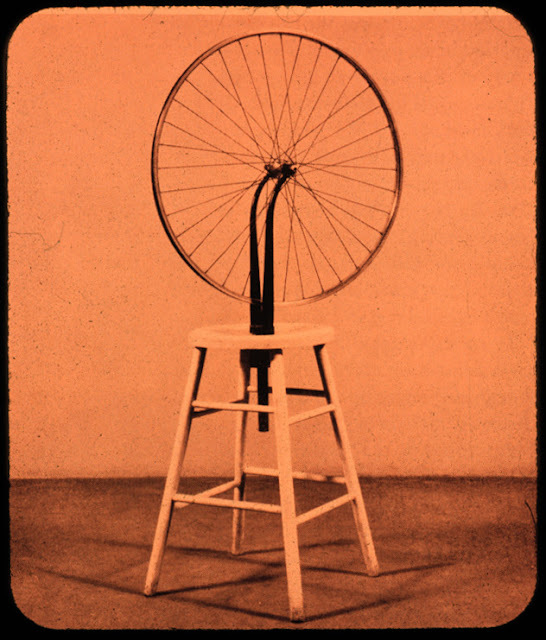 Another aspect of the "Readymade" is its lack of uniqueness... the replica of the "Readymade" delivering the same message, in fact nearly every one of the "Readymades" existing today is not an original in the conventional sense. Since the tubes of paint used by an artist are manufactured and readymade products we must conclude that all the paintings in the world are "Readymades aided" and also works of assemblage.